B-Grade horror movie action comes to the Virtual Console. Every once in a while a game is released that's so unique it garners a cult following and becomes more popular years later than when it was first released. 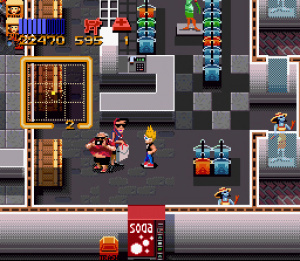 Toe Jam & Earl for the Sega Genesis is one such game, but another prime example would be Konami's Zombies Ate My Neighbors. The game takes the "B" grade horror movie theme and builds a unique action game experience around it that feels like a cross between a shoot 'em up and a scavenger hunt. 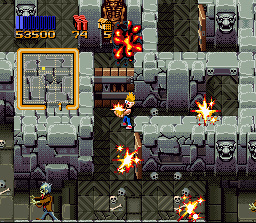 The end result is one of the most unusually enjoyable action titles available for the Super NES system and one that no zombie-slaying-maniac-in-3-D-glasses should ever be without. 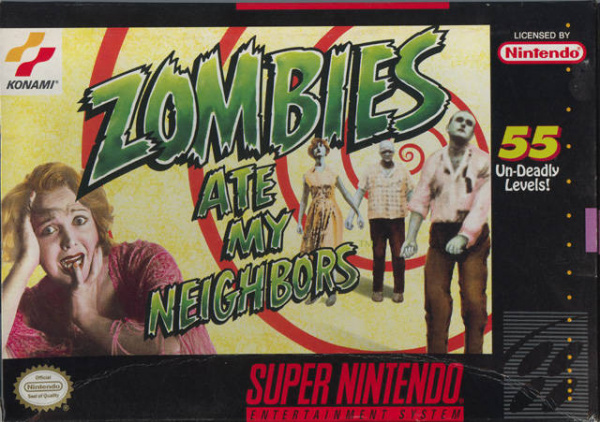 Your goal in Zombies Ate My Neighbors is simple: you have to locate and rescue ten of your neighbors before the zombies and other ghouls get their hands on them. Along the way, you'll be chased by everything from tiny axe murderers to chainsaw-wielding madmen. Under normal circumstances this might seem impossible, but you have the unique distinction of being armed to the teeth, which will make it at least a little easier to accomplish your task. Your main weapon is a water pistol filled with holy water that can take down most of the weaker enemies, but you're going to need the big guns to take down the stronger monsters. You'll find dynamite, a bazooka, not to mention a potion that can turn you into a huge scary monster, to aid you on your quest. Once you've managed to rescue all of the neighbors, a door will open up that will warp you to the next area where you must start the entire process all over again. The control in the game is rock solid and the large selection of different weapons gives the game plenty of variety. The levels start out fairly easy, but they'll soon become much more complicated and finding the neighbors will become increasingly troublesome, not to mention the fact that the monsters become more aggressive. You'll really have your work cut out for you in the later levels of the game when the action gets insanely intense. The good news is the game's responsive play controls give you every chance you'll need to be successful, although you'll have to supply the skills of course. 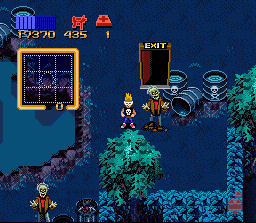 Visually, Zombies doesn't exactly set new 16-bit standards, but it still manages to look sharp and the creative use of the darker color scheme used throughout the game really makes the creepy visuals come to life onscreen. The monsters animate well enough, but in all honesty you won't have much time to stand around and admire the scenery, since you're going to be constantly chased around by the monsters in the game. Each area has its own distinct look and feel, so there's always something new to look forward to as you enter each new world. Zombies might not be the best looking Super Nintendo game, but it's still got it where it counts. The music in the game is as outrageous as the scenery. All of the tunes have a menacing and spooky sound to them, and couldn't fit the mood of the game any better. Even the sound effects are incredibly creepy and realistic: you'll honestly feel like you're smack dab in the middle of an old-fashioned horror flick. About the only complaint that can be leveled against the game is that many of these musical tracks are repeated a bit too often; while the tunes are great, they do become a little repetitive after you've heard the same one over and over again. If you find yourself all played out on the typical action titles available on the Virtual Console service, it might be a good time to try something different. Zombies Ate My Neighbors should fit that bill quite nicely: if you took Contra and somehow turned it into a second rate horror movie, this is probably what you'd end up with. Suffice it to say, if shooting everything in sight and blowing stuff up is your thing, you're going to love this unusual Super Nintendo action title. It might be a little on the strange side, but any time you're given the opportunity to shoot a zombie in the face with a bazooka, you know you're in for a real treat. And at 800 Wii Points, it won't break your wallet either. haha I played this as a kid. Awesome, I hoped this would be reviewed soon. Great review Corbie. I've had an unopened points card for a while now and I think its just about time to open it. Because of this, Excite bike WiiWare (coming soon), CV Rebirth, and a few others. Was this already reviewed except from being on Virtual console Awhile ago? It's the same review, and just as great, only it's been shifted to this page as well, it seems. I'm so stoked! I can't wait to download ZAMN!! IGN gave it a 7?! They really do hate the Wii then. 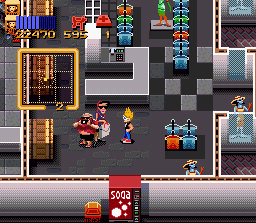 Also, the guy with the 3D glasses looks a lot like Johnny Test. Edit: IGN didn't give it a 7, it was an 8! I sure did overreact there. @eggmiester: No problem. I just knew how IGN could be when it came to some wii games. sadly I never even played this back when it was new. It looked really dumb. I'll have to get it now. Can anyone tell me which controllers it uses? Can I use just a remote, or do I need a classic? @rena like all super nintendo games you use game cube or classic controller. You reviewed both Final Fight 2 and now ZAMN right before they came to VC. Maybe if you review TMNT: Turtles in Time, it will actually be released! I can dream, can't I? @Bulbasauras Rex <-- I agree with theory. Not sure if this is my type of game. Though I thought that about Excitebike after hearing about the new WiiWare game, then remembered I earned it in Animal Crossing for GCN. I played it tonight, enjoyed it. Maybe this game would be the same way. Sounds entertaining by the review's standards. It's a 1 point difference on a decades old game. CALM DOWN. This is why reviewers get pissed off - people overreacting just cause they liked a game more than the reviewers. There's even been people arguing about IGN giving a 0.1 difference between scores on entirely different games. If you like a game, you're going to buy it none the less. Don't overreact cause someone had a different opinion than you on a game or console. Also, some Wii games just aren't that good. Look at the score aggregates. We get less top tier games according to more reviews than just IGN. Downloaded it Monday and have no regrets. I love this game! That giant baby is creepy as hell. Great game! as a young lad walking through the game rental store, i always stopped and looked at this game. I never played it. I wonder why? Probably because all i would rent was Bubsy and Micky's Magical Quest. I never have understood the criticism of IGN. You guys know that they have a seperate team for reviewing Wii games right? There is a retro guy who reviews the VC games, but he has always been pretty fair in my opinion. Much fairer than Gamespot's VC reviews (they have only reviewed about 1/3 of all released VC games). But you never see the PS3 team reviewing Wii games and giving them bad scores because they hate the Wii. I never could get into this game. Can't remember why, though, but still it doesn't really seem that interesting. Make sure you play this game with a friend, it's a whole different experience that way. This game was one of the greats, glad to see it finally released. @brooks83: The main problem I have with the guy that does the VC reviews on IGN is mostly that he never seems to actually look at the games from a retro perspective. I can understand that they're getting released again, but seriously, bashing Pokemon Snap just because it didn't include the extra 300+ Pokemon that have surfaced since Snap came out is just plain nitpicking. @10 Use the Classic controller. The gamecube controller makes it akward with the d-pad positioned where it is. I frankly don't mind the repititive tunes. They're all catchy. Great review Corbie! I'm going to download it either tomorrow or Saturday. I remember playing ZAMN all the time with my step brothers when I was younger. It was such a fun game, but I always got stuck being the girl. >.< If it wasn't for college and all the assignments I get stuck with I would have downloaded this on Monday and played all night long. I never beat the game when I was younger. Hopefully I'll be able to get through it now that I'm older. Great review Corbie! I have never played this game before. Now that it's finally out on the Virtual Console I can give it try and see what I have been missing out on all these years. The IGN review errors, about no radar and no way to earn extra victims have since been corrected. i downloaded this on my wii and must say its very very good. This is one of those games that simply never gets old for me. It combines shooting, exploration, and even a touch of survival horror (to an extent anyway) seamlessly, and is one of my favorite SNES titles. Too bad we never saw a real sequel to it.